Earlier this week, GMO's James Montier repeated verbatim one of our recurring puzzling observations about the current market: while "a recent Bank of America ML survey showed the highest level of those citing “excessive valuation” ever. Yet despite this, the same survey showed fund managers to still be overweight in equities." Back in August, we called this just one of the many bizarre market paradoxes observed in the market. As we noted earlier, after last week's volocaust, this week was the best week for global stocks since 2011 as traders and algos furiously BTFD (and sold vol), clearly forgetting what happens when markets become too stretched, as they are becoming again. It wasn't just stocks: junk bond yields dropped the most in three months, and CCC yields saw the biggest drop in more than five weeks yesterday amid what is reportedly buying flurry. As Bloomberg put it, "it was as if high yield investors were making up for the lost week" with HYCDX rising the most in 11 months, and junk bond ETFs, JNK and HYG, saw the biggest increase in three months. As one would expected, junk spreads tightened across ratings. And yet, despite surging prices, investors couldn't wait to get the hell out of credit amid the sudden repricing of inflation expectations which are certain to send yields higher (unless, of course, another wave of deflation emerges). In fact, BofA finds that last week saw the first simultaneous outflows from IG, HY and EM bond funds since the U.S. election. According to BofA, which cited EPFR data, a whopping $14.1 billion was pulled from debt funds, with $10.9 billion taken from high-yield bonds alone, the second highest outflow on record. Investment-grade bond funds also weren’t spared, with $2 billion of redemptions ending a 59-week streak of inflows, BofA reported. The iShares LQD Investment Grade Corporate Bond ETF posted a record one-day outflow Wednesday, the most among U.S.-listed passive vehicles across asset classes. Separately, a report from Lipper confirmed the bond exodus, as investors pulled $6.3 billion from high yield bond funds for week ended Feb 14, the second biggest weekly outflow on record, and the fifth straight week of outflows, with the total over that period rising to $15 billion according to Bloomberg. The biggest outflow on record was $7.06b in August 2014. Derivatives tied to corporate bonds moved more than the underlying cash debt last week - another sign that investors sold more liquid holdings during the equity turmoil rather than offload harder-to-sell debt, according to JPMorgan Chase & Co. Which begs the question: if everyone is selling, how are yields lower and spreads tighter; i.e. who is buying? "Investors don’t sell their cash bonds in a big way until they are forced to, which happens when the outflows start picking up more sustainably," Morgan Stanley wrote this week. 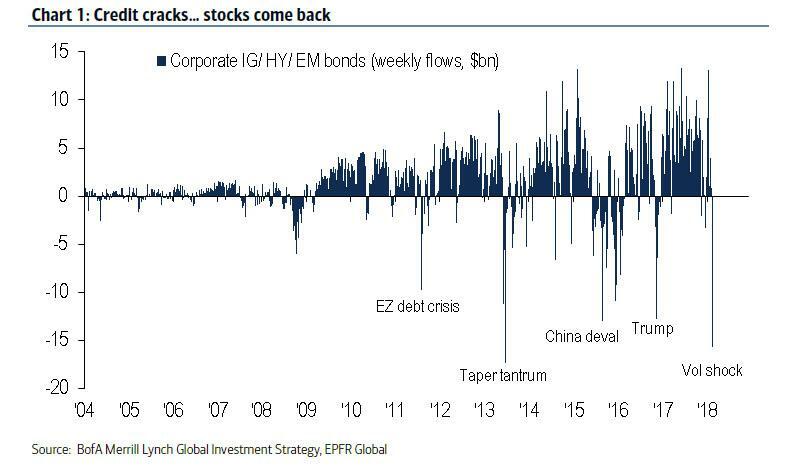 Meanwhile, there was a similar paradox in stocks, where equities recovered from last week's record $30.6 bn in weekly outflows with $5.9bn in global inflows in the latest week, although US equity redemptions continued and saw $7.2 billion in money pulled after last week's record outflows. The problem is that while equity vol tends to fade fast, a similar move in bonds or rates, could have far more troubling consequences: “The narrative is really becoming more about inflation and rate risk creeping into the broad markets,” said Henry Peabody, a money manager at Eaton Vance Corp., with more than $400 billion of assets. "It’s hard to think of elevated volatility in both rates and equity not eventually seeping into credit." These indicators may signal the tide is shifting. As recently as last week, corporate obligations outperformed -- anchored by long-term investors that stayed put while gauges of stock and rates volatility surged. Risk premiums on corporate bonds widened by a modest 10 basis points even as global stock indexes flashed bear-market signals. 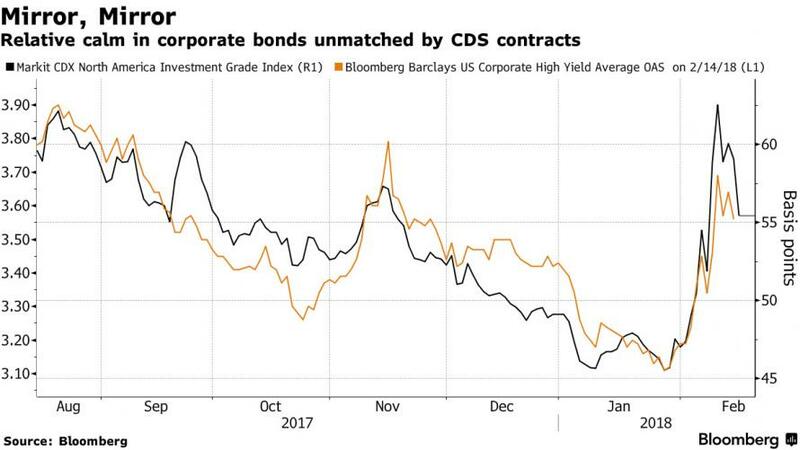 As Morgan Stanley adds, "creeping corporate leverage is setting the stage for a broader market meltdown while higher real rates drive down asset values." Needless to say, Morgan Stanley projects negative returns for corporate bonds in the U.S., Europe and Asia in 2018. They warned that companies would struggle to refinance rising debt loads, just as rates rise and a tide of ‘tourist’ investors who’d dabbled in riskier debt abandon ship. “It’s a wake-up call that central banks are withdrawing liquidity, and that the process is not going to be smooth,” the Morgan Stanley strategists wrote. As for the punchline, we go to Federated Investors' trader Gene Neavin: "As the days of low inflation, low rates and low volatility are coming to an end, investors are realizing that the Fed party is over." As usual, equities won't care until after the wake up call.